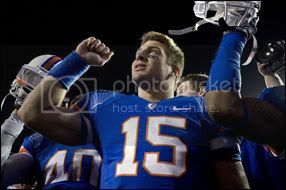 As was expected prior to the showdown with the Florida State Seminoles, the national media has used Florida Gators senior quarterback Tim Tebow‘s final home game as a chance to discuss his talent and character front-and-center. Bruce Feldman of ESPN Insider starts it off questioning if Tebow is the sole player who has successfully bridged the gap between folk hero and cult hero. “How do you resent someone who is so relentlessly positive in his off-field work for charitable causes?” Feldman wrote. “Or the fact that the guy is in front of microphones so often and never says the wrong thing? Tebow’s too good to be true, no? Maybe. Maybe not. He certainly seems to have done the work.” Pat Forde takes it from there, saying it is the generosity of his spirit that separates Tebow from the pack. “We can vigorously debate Tebow’s place in college football history as a player,” Forde writes. “What’s not up for debate is his unparalleled ability to provoke the deepest of feelings in fans of the sport. 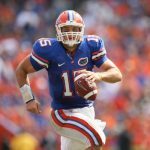 He said afterward that he wants the fans to remember him for ‘how much I cared.’ The fact is, fans have never cared so much about a player before.” Andy Staples of SI.com recognizes Tebow for his stellar career, but almost begs Heisman Trophy voters to leave him off the No. 1 slot on their ballots, saying it is not a career award. Maybe so, but the Heisman is also not a statistics-only award either. All three of the aforementioned columns are must-reads. Check them out and then come back here to OGGOA and discuss what you just looked over.